Your resource for all things shoegaze and dream pop: Donate to help get Music for Headphone's album Life.in.Mono on vinyl! Donate to help get Music for Headphone's album Life.in.Mono on vinyl! 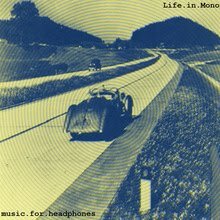 Music for Headphone's release, Life.in.Mono, most certainly tops our list as one of the best releases of 2011, and after garnering much praise from all over the world, MFH wants to raise money to help get this masterpiece pressed onto vinyl - the format it was intended to be heard on. We all know pressing wax is pricey, but the end product is absolutely worth it. Support Music for Headphones by donating to their Kickstarter project...I personally want this album on vinyl BADLY and will be making my donation soon, so let's make it happen gazers! CLICK HERE to read about the project and to donate! Do your part. Check out Life.in.Mono on bandcamp!